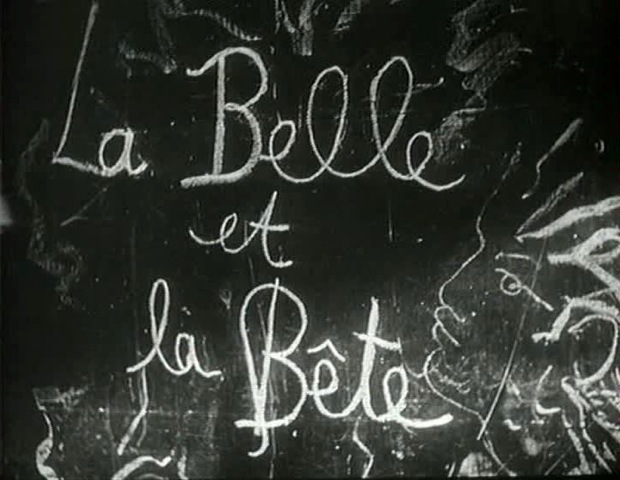 Above: credit sequence for La Belle et la Bête, playfully chalked onto a blackboard by the cast and director. 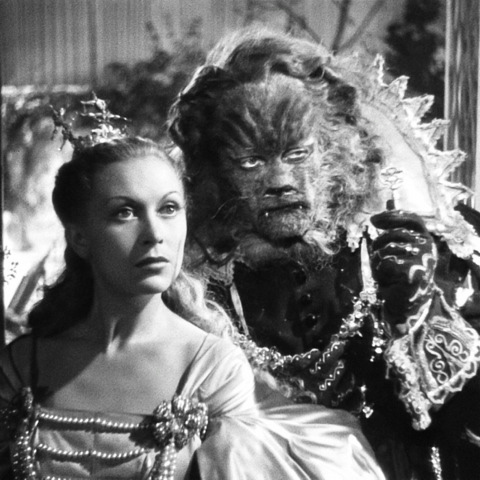 I could write a book extolling Jean Cocteau’s magnificent La Belle et la Bête, but must confine myself instead to a three-part paean of praise. 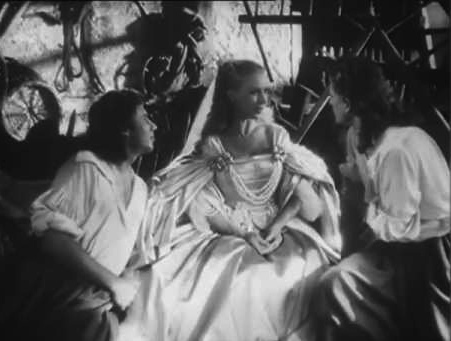 For me it’s the almost perfect evocation of fairy tale, a genre much attempted in the cinema, yet never as effectively conjured as in this shimmering 1946 film, made in France under the most difficult circumstances just after the war. Above: hands stiff with glue, hair and talons, Marais was rendered too clumsy to handle a spoon. 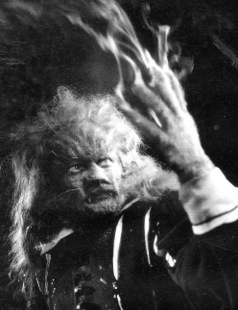 In his Beast’s make-up he had to rely on on co-star Josette Day to assist him at mealtimes. Marais makes an unforgettable sight with his leonine head framed by a high-standing collar. The wide-shouldered, inky velvet doublet seems barely to contain the bulky animal physique straining inside it. He walks upright, but there’s the sense that he does so painfully, clinging to the last vestiges of a humanity fast ebbing away. The arrival of Beauty arrests his transformation, because in her he sees everything that will be lost to him. Against the Beast’s degeneration, Day is a lamp in the darkness, incandescent in voluptuous satin, gleaming roped pearls and the balloon sleeves that accentuate the creamy vulnerability of her throat and head. 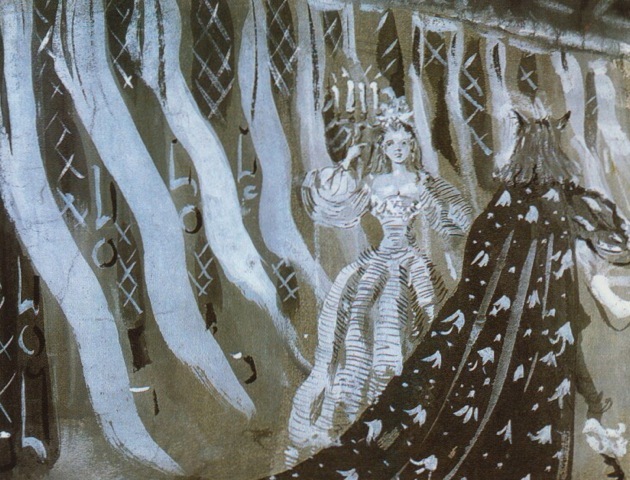 Above: Christian Bérard’s design for decor and costumes suggests a corridor with billowing, gauzy curtains. 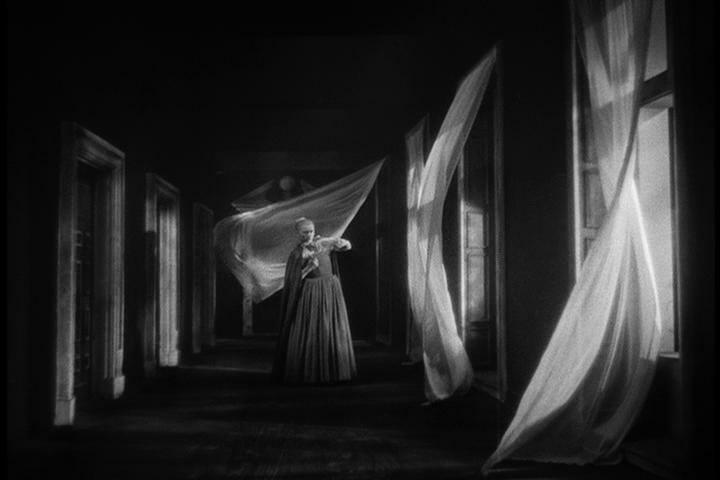 Below: the scene as it was realised, rendered dream-like by having the actress ‘glide’ on hidden wheels, an effect much loved and subsequently imitated by film-makers. 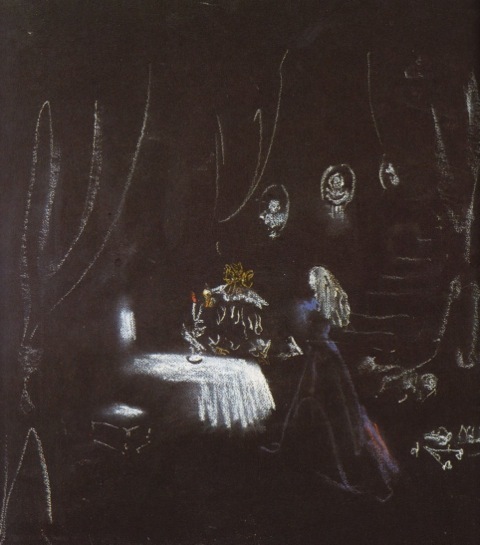 Berard’s chalk sketch (see above) for the decor of the Beast’s dining-room shows his innovative use of a ‘black void’ with accents of design. This stroke of genius produced a fantastical realm for the enchantment to unfold in (see below), yet on a tiny budget. 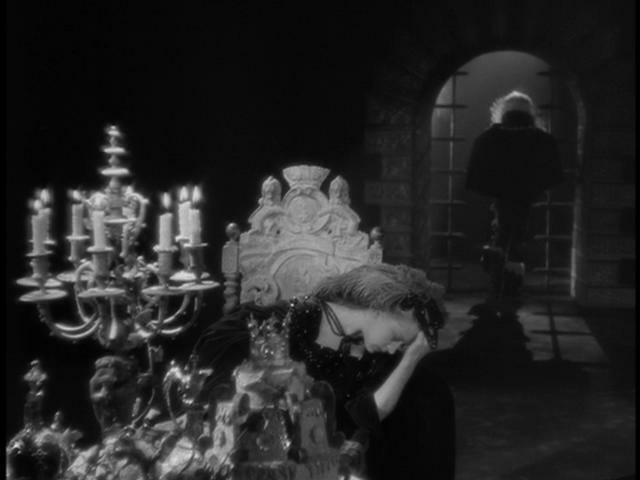 Many film designers could learn from Berard’s example that lavishness on too great a scale merely creates visual muddle. 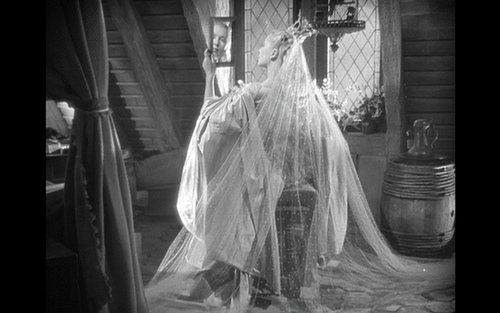 The designer gave Cocteau only as much as was needed to conjure the magic for the camera, and no more. 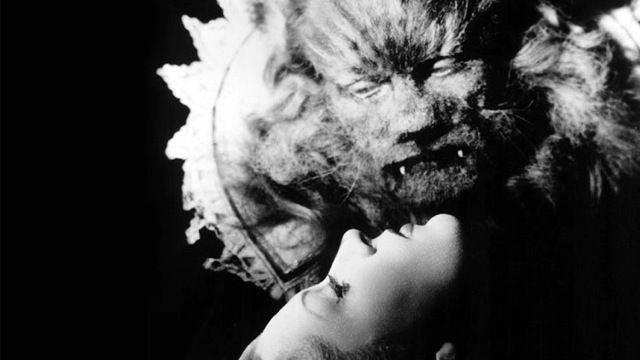 The eye never gets distracted or weary when watching La Belle et la Bête. We see what designer, director and cinematographer wanted us to see, and the rest is shadow. 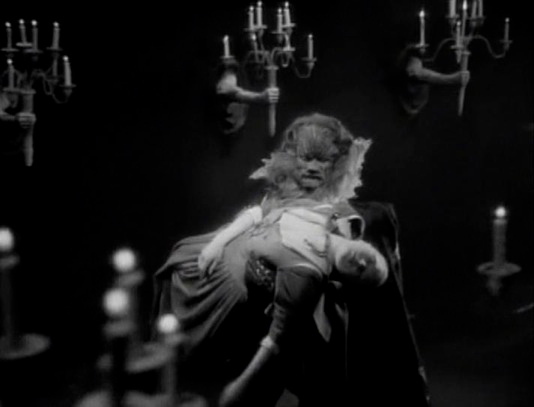 In the Beast’s dining-room where Beauty’s father finds a table laid for supper, two ‘living’ stone heads supporting the fireplace mantel awaken, smoke coiling from their nostrils, an effect underlined by the trembling sheen of Georges Auric’s almost hallucinogenic score. My scalp prickles when I watch this, the moment never failing to thrill no matter the many times I’ve seen it. Everywhere in this castle, pale disembodied arms support candelabra, or rise up with pitchers from the table to charge goblets. 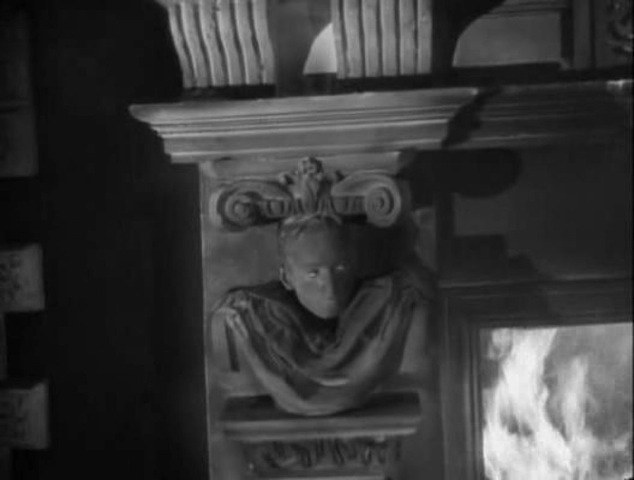 The eyes of carved heads follow whoever passes. It’s eerily, unforgettably beautiful. 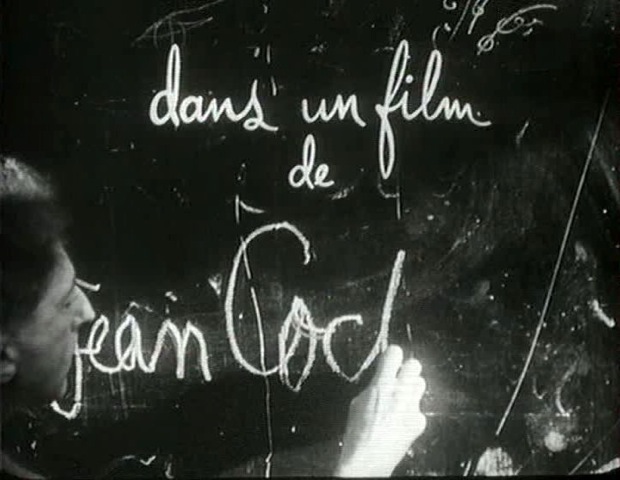 Above: Cocteau signs his credit sequence. This entry was posted in Uncategorized and tagged Christian Bérard, Georges Auric, Jean Cocteau, Jean Marais, Josette Day by Clive Hicks-Jenkins. Bookmark the permalink. oh, i so agree about the visual muddle, but it takes immense talent to make a few squiggles in the darkness be so suggestive…wonderful! It’s a film of such lasting artistry. I can think of no way in which it could be bettered.